Hollywood has now given such a bad name to romantic comedies, it's essentially thrown in the towel and stopped making them. (Go ahead: try naming one successful studio-made rom-com from the last couple of years.) For some people that may not be a terrible loss, but I'm not one of them. I'll always enjoy a clever, truly funny rom-com—hold the schmaltz—and I'm sure there are other manly folk out there who secretly like to watch couples meet cute, fight, then make up while we grin foolishly and pretend there's soot in our eye. That's where independent filmmakers are able to pick up the slack. In place of stratospheric budgets, exotic locations, or superpowered special effects, romantic comedies demand little more than a solid script, a likable, talented cast, deft direction, and an ability to breathe freshness into situations we've all seen a thousand times. A tall order, certainly, but one that, like any good indie, can be achieved for the price of a digital camera and a cast and crew willing to subsist on pizza, bagels, and passion. Sure, the results can be as bad and predictable as anything starring Katherine Heigl or Kate Hudson (*shudder*). But there are also unheralded gems able to climb their way out of the streaming indie muck (for examples, see my reviews of Stuck Between Stations, Cashback, and In a World). Some of these combine a surprising level of star power, professionalism, and originality, and are more than worthy additions to a genre all but abandoned by the studios who invented it. I'm not saying any of the below titles are the next It Happened One Night, When Harry Met Sally, or Silver Linings Playbook, but each offers its own unique take on the pitfalls of finding love in the modern world. Despite its generic, rom-com-sounding title (ugh, not another wedding movie! ), Save the Date still had me wondering how bad a film starring Lizzy Caplan, Alison Brie, and Martin Starr could possibly be. The answer, it turned out, was, "Not bad at all." As representatives (joint and otherwise) of three very funny cult comedy series—Freaks and Geeks, Party Down, and Community—the three stars promised to deliver at least a few laughs (and of course it's never hard to watch Ms. Caplan or Ms. Brie, who hit a sweet spot of smart/funny/gorgeous that can warp the faculties of even the harshest critic). Taking what seems a standard premise and a typical assortment of angsting twentysomethings, director/co-writer Michael Mohan deftly avoids the genre's usual tropes in favor of characters with real-life shadings, whose relationships (romantic, filial, and otherwise) exhibit a refreshing dimensionality. Caplan and Brie are perfect as sisters Sarah and Beth, their shared behavior and conversational tics hinting at a believable joint history. Brie and Starr, meanwhile, stretch beyond their 30-minute TV personas to convincingly portray a long-term couple nervously approaching their wedding day. Nearly as well-defined are the two men in Sarah's life—recent ex Kevin, played by Geoffrey Arend, and rebound guy Jonathan (Mark Webber). In an interesting reversal, these competing romantic interests are actually more sympathetic (if less layered) than either Sarah or her sister, and offer a nice change from the usual patsy/heartthrob stereotypes. As an indie trying to consciously avoid romantic comedy cliches, Save the Date may try a bit too hard (especially at the very end), but its unpredictability and the likable rapport of its cast make for enjoyable company. And, unlike so many Hollywood versions of this story, it doesn't leave you feeling like you ate too much sugar when the credits roll. When it comes to modern romantic comedies in the classical mold, Jennifer Westfeldt has few peers. She's written and starred in three, one of which she also directed (Friends with Kids), each time managing to construct smart, funny worlds filled with flawed, identifiable—and usually neurotic—people looking for love in unconventional ways. 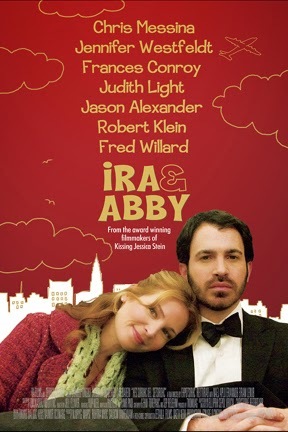 Ira & Abby, her follow-up to 2001's Kissing Jessica Stein (reviewed here), is an underseen bauble from 2006 that stars Westfeldt, The Mindy Project's Chris Messina, and a veteran supporting cast that includes Fred Willard, Robert Klein, and Jason Alexander. Combining its love story of two misaligned—and impulsive—souls with a not-so-gentle skewering of urban navel-gazing and psychoanalysis, the movie lives in the kind of heightened big-city reality that so many memorable romantic comedies are constructed upon. As in the best work of Woody Allen, Billy Wilder and Preston Sturges, Ira & Abby seems acutely aware of its artificiality while at the same time making this a strength. Not to unfairly elevate Westfeldt into such rarefied company, but among today's screenwriters she stands out as someone who seems to take as much care (and pleasure) in crafting plot as in the words her characters so enjoyably utter. It's a real treat to hear the kind of smart, witty dialogue that was once the norm in such movies. Call me an old-fashioned, elitist, urban snob, but as Hollywood continues to make the term "rom-com" synonymous with "crap," smart handcrafted indies like Westfeldt's have become all the more valuable for reminding us that tickling the mind can be just as crucial as tugging the heart. 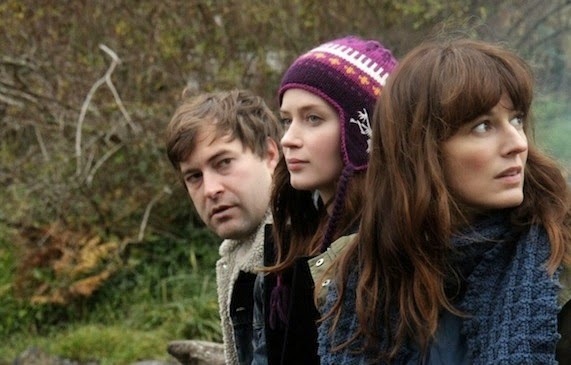 Veering in the opposite direction, Lynn Shelton's indie romance Your Sister's Sister eschews stylization for an essentially realist approach, leaning more toward drama than comedy as it portrays a love triangle between a man and two women—in this case, two sisters. That's not to say it isn't funny. But the laughs are less about artful displays of wit and exaggerated comic situations than about the awkward behavior and personal dynamics among three flawed fellow humans. As in most of her films, including Hump Day and Touchy Feely (see review), Shelton concocts a situation that's highly unlikely on paper—one that could become tragedy as easily as farce—then takes a grounded, improvisational approach to invest it with an emotional reality that prevents you from ever doubting its truth. The loose, lived-in performances by Mark Duplass, Emily Blunt, and Rosemarie DeWitt go a long way toward selling it, their obvious comfort levels as actors allowing them to believably plumb the depths of discomfort, while at the same time—especially in the case of the sisters—suggesting an intimacy that goes well beyond present circumstances (much like Caplan and Brie in Save the Date). Adding to the film's believability are the contributions of Shelton regulars Benjamin Kasulke and Vinnie Smith, whose combined images and music lend the gorgeously somber Washington locations an organic sense of longing. Probably more than any of Shelton's films, Your Sister's Sister represents the perfect blend of mumblecore's fumbling emotional immediacy with classical character-driven narrative. It's funny, and possibly ridiculous, but it remains emotionally truthful (and yes, heartwarming) to the end. If it shows up in streaming, check out Priceless. It's a romcom with Audrey Tautou and it owes a little something to Dirty Rotten Scoundrels as Tautou teaches a young bartender smitten with her the art of gold digging wealthy lovers. Yeah, that one was fun--saw it the last time it was on Netflix. Expired in 2013, I think. Hey! thanks for posting this - I love a good RomCom...!